It wasn’t so long ago that Austin became a sleepy little town in the summer, drained of students and lulled into months of inactivity by the heat. The heat may not have changed, but Austin’s now a fast-paced city, any time of year. And some of its most beloved institutions, like the Long Center, have grown with it. Proof of that is the fact that the Long Center saw 113,000 people come through its doors this summer between Memorial Day and Labor Day, many of them first-time visitors. That’s despite national trends, where attendance numbers for performing arts venues are flat or declining. While great programming undoubtedly has a lot to do with that success, some Long Center staff say it’s also the way employees are valued that leads to a great team and a flagship venue. 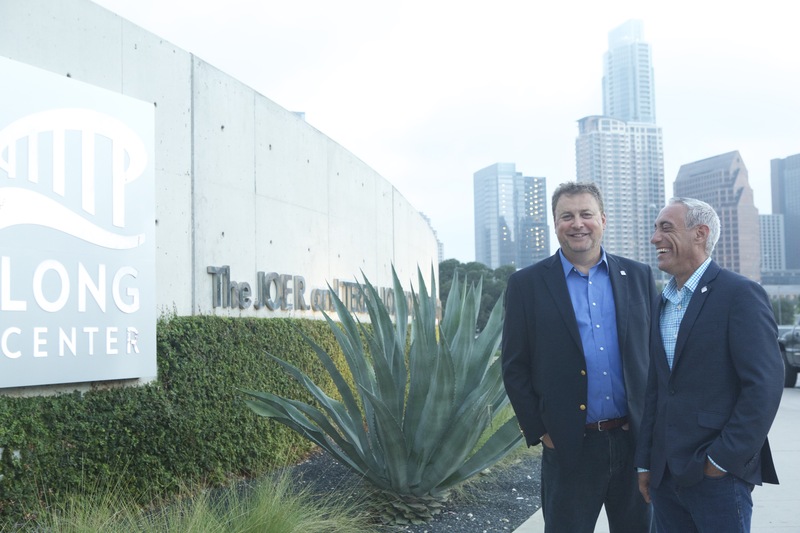 For Tony Jilek, vice president of sales and marketing at the Long Center, the fact that the Long Center was different than other offices he’d worked in became obvious not long after he met Jamie Grant in 2011, when Grant became the Long Center’s executive director and CEO. Jilek recalls attending a Long Center donor event shortly after marrying his partner of 14 years, Floyd. Out of habit, Jilek introduced Floyd as his partner instead of his husband. Grant noticed the introduction, and made a point of asking Jilek about it later. Jilek also recalls Grant giving him advice before he and Floyd married, saying that getting married would feel different, even though they’d been together for a long time. For Grant’s part, it’s a no-brainer to treat all employees well. It may be the entertainment industry, but it’s hard work. Grant says he’s up at 5:30 every morning, and at his desk by 7:00am, and there’s often a lot of weekend work. That can take a toll on the family, but when an employee’s family feels valued and included, that means a happier family and a happier employee, he said. It’s a practice that’s obviously working well. The Long Center has cemented its reputation as a home for the arts, but also as a community gathering place. When the U.S. was playing in the quarter finals of the World Cup last summer, Grant recalls a last minute decision to host a viewing of the game. Whether it’s David Sedaris, the Austin Opera, Trailer Food Tuesdays on the terrace, or Jimmy Kimmel broadcasting a week of live shows, the Long Center is playing an exciting role in a growing city. More than just a venue, it’s a community asset that’s growing along with Austin – growing so much, in fact, that estimates show 375,000 people will walk through its doors next year. For a full listing of events at The Long Center, click here.